All 22 students in Lost River Jr./Sr. High School’s Class of 2018 are headed to university, college or other post-secondary education. 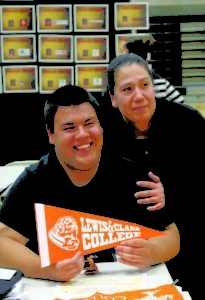 The school and community celebrated with a National Signing Event on Tuesday. Families, community members, staff and students watched as the seniors signed on to their futures after high school. “I think it’s cool that at a small school we get to recognize everybody going to college,” said senior Allison Grounds. The event included speeches and college representatives congratulating the seniors and welcoming them to the next big step. Students in the Class of 2018 is going on to a variety of post-secondary education. Twelve signed on to KCC, two to Western Oregon University, two to the College of Cosmetology, one to Blue Mountain Community College, one to Montana State University, one to Oregon State University, one to Willamette University and one to George Fox University. 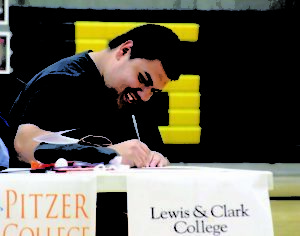 Murillo, 18, held the crowd in suspense on Wednesday, deciding between Pitzer College in Clermont, Calif., and Lewis & Clark College in Portland. Both have strong liberal arts programs, which he thinks will make a good foundation for his plans to study medicine or pediatrics. “I plan to someday open a clinic in Malin, help the members of my community,” he said. In the end he chose Lewis & Clark, to cheers and claps from a gym full of onlookers. He received enough scholarships to completely pay for his college — a full ride. Grounds, 18, also received big scholarships from her college of choice, Willamette University. She received more than $30,000 in scholarships and grants. She plans to study law. 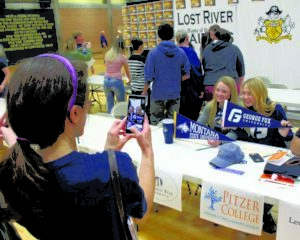 This was the second annual Signing Day event at Lost River. Last year Grounds, Murillo and their fellow students watched 34 students in the Class of 2017 sign on to their colleges and military service. This year, the Class of 2018 set the example for those coming after them.